A new toy ... and lots of work... Yesterday I took delivery of a front-mounted auger for my tractor. This thing is powered by a hydraulic motor that needs 6 gallons per minute (gpm) of hydraulic fluid flow. My tractor can deliver 7 gpm, so it's just barely big enough to handle this thing. 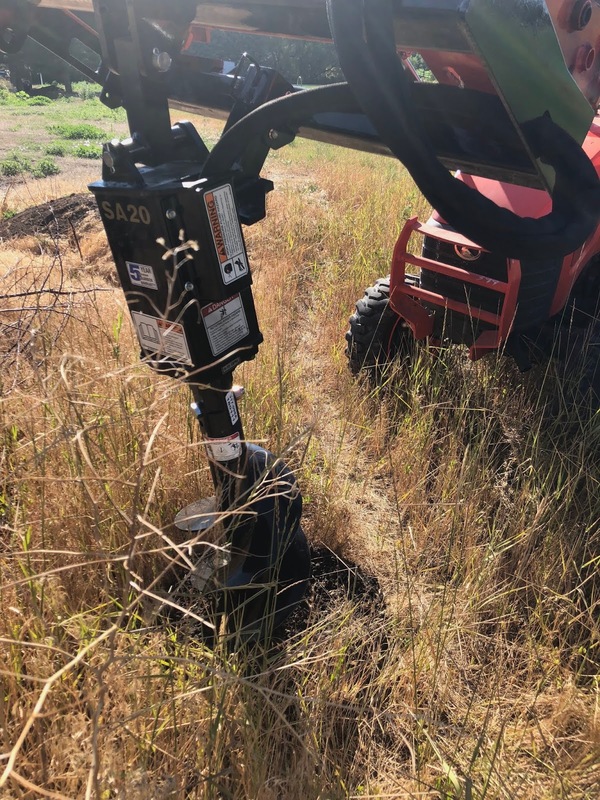 There was a small problem at first – it was delivered with the wrong hydraulic connectors – but once that was fixed, it worked beautifully. I dug a few test holes today; all worked just fine (photo at right was taken during the second drilling). 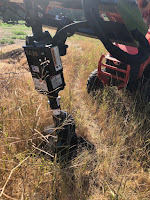 This auger is going to let me plant a bunch of trees, and place a few posts for various things I want to mount in the ground. My brother Scott has been working at our place for the past two days, and will be putting in roughly half-time for a while. He's tackling our landscaping (and that's a big job!) as well as some maintenance items like pruning. He's plenty crazy enough to do this work for free, so I didn't let him start until he agreed to be paid a reasonable amount. Yesterday he went to work on making measurements for the front of our house, which is his first project. Today he and I tackled several pruning jobs (and there are lots more remaining! ).